150 years ago, U.S. Army General-in-Chief Henry Halleck had a grand plan for the war in the west — open the Mississippi River by a cooperative movement of Gen. Grant from the north and Gen. Banks from the south. The problem was that the two were separated by over 150 miles of river protected by strong fortifications at Vicksburg and Port Hudson. Both Grant and Banks sought ways to get around the Confederate strongholds. Grant directed expeditions that cut levees, cleared trees and dug canals in order to link the Mississippi to other waterways, like the Yazoo and the Tensas. Banks attempted something similar in the Atchafalaya basin. For those, like myself, who are from other regions of the country, it can be a challenge to visualize the landscape along the lower Mississippi — tangled, flooded lowlands crisscrossed with bayou and lakes where the boundary between land and water was blurred. Due to levees, the Mississippi was often higher than the surrounding area. A cracked levee along the Mississippi could send water spilling over miles of land. For example, Grant’s effort to link the Mississippi to Lake Providence resulted in flooding of “about 900 square miles of Upper Louisiana”. Other waterways, not bound by levees, regularly inundated the adjacent countryside, creating vast swampy areas that made land movement challenging. At the same time, these waterways were often choked by trees or sandbars which could make water based movement difficult. Nonetheless, the interconnected waterways, with a little bit of effort, could allow for alternate lines of movement. The Atchafalaya River flows for about 150 miles from the end of the Red River to the Gulf of Mexico. The Atchafalaya is thought to originally have been the path of the Mississippi and then it became the extension of the Red River during a time when the Red and the Mississippi were not connected. Once the Red and the Mississippi joined, the Atchafalaya became an alternate path for a mix of water from the two. For many years the point where they met was a complex hydrologic feature — under some conditions, water from the Red would flow into the Mississippi; under other conditions water from the Mississippi would rush into the Atchafalaya. In the mid-20th Century the U.S. Army Corps of Engineers built massive dam and sluice structures to control the flow between the Mississippi and the Atchafalaya. Without this it had been speculated that the path of the Mississippi might permanently switch into the Atchafalaya, causing its current path by Baton Rouge and New Orleans to become a stagnant backwater. The Atchafalaya Basin is a wilderness of bayous, lakes and swamps that borders the Atchafalaya River. Considered the largest swamp in North America, the Atchafalaya Basin is dynamic landscape. Over time water levels fluctuate, floods change land patterns and sediment and drift change rivers. 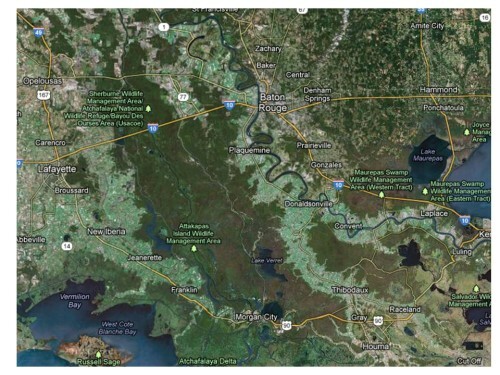 In satellite images, such as the one below from google maps, the Atchafalaya Basin is clearly visible as a vast undeveloped wilderness in the middle of Louisiana. 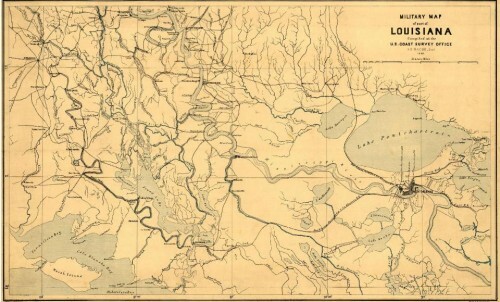 The 20th-Century flood control measures have tamed the ebb and flow of the Atchafalaya, contributing to the clogging of Grand Lake which at the time of the Civil War was much more open, as shown in the 1862 map below. When Banks arrived in New Orleans in December 1862 he reoccupied Baton Rouge and tried to determine how he could advance northward to Vicksburg. Port Hudson was held by a strong and growing garrison so Banks looked for a route around it through the Atchafalaya basin. 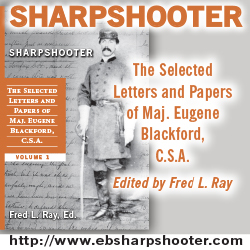 He directed Gen. Emory, who before the war had been an explorer and map-maker of the Army Corps of Topographical Engineers, to find a route from Plaquemine, on the west bank of the Mississippi south of Baton Rouge, through to the Atchafalaya. At the same time, the navy sent a couple of boats up Grand Lake from Brashear City [modern day Morgan City] in order to link with Emory from the other side. The navy found that every route was blocked. On the way back, the USS Kinsman caught a snag, ripping her hull, and sank. 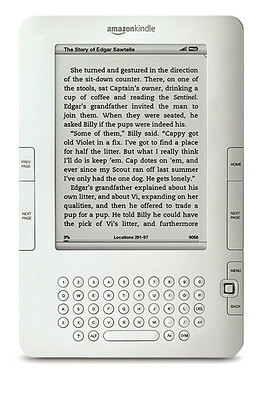 Emory met with similar problems: “Every bayou choked with drift-wood — impassable and immovable”. Rising water was also found to be “flooding what little land there is”. Still Emory persevered through most of February, believing he could still find an alternate route. After moving about 10 miles west from Plaquemine to Indian Village, he directed his command north up Bayou Sorrel to Rosedale. Emory’s sent a recon force further, making almost opposite Port Hudson. But the Confederate commander at Port Hudson, Gen. Gardner, sent a force across the river to chase off the federals and cut the levee, further complicating the terrain. Without a useable route through the Atchafalaya basin, Banks’ first plan had failed by the end of February. He turned to his leading subordinates for advice as to what to do next. Some suggested a direct assault on Port Hudson but General Weitzel proposed a plan that would take on Taylor’s command on Bayou Teche near Franklin, Louisiana. At this point, Port Hudson was stronger than ever, with reinforcements arriving at the beginning of March. So after supporting Admiral Farragut’s run past Port Hudson in mid March, Banks put Weitzel’s plan in motion. As a result, the course of the campaign in Louisiana would follow a wide arc from Brashear City westward around, instead of through, the Atchafalaya.